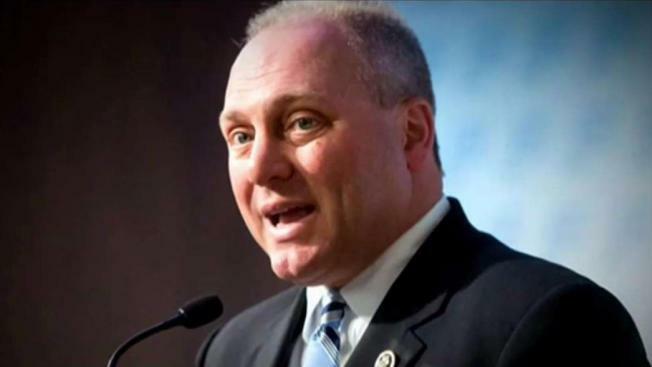 A prosecutor's report found officers from the U.S. Capitol Police and Alexandria, Virginia, police department fired more than 40 rounds to subdue and eventually kill the man who shot and wounded Congressman Steve Scalise and others on a northern Virginia ballfield. The report released Friday by Alexandria Commonwealth's Attorney Bryan Porter concluded officers were justified in using lethal force to confront 66-year-old James Hodgkinson. In his report, Porter acknowledged the situation "obviously required the agents and officers to use deadly force," but he said "the facts cannot be considered 'clear-cut' until their totality is known." Media files recovered from Hodgkinson's phone show video of Simpson Field that was recorded in April 2017, the report said. Witnesses reported seeing the gunman walking around the field in May 2017. On June 14, Hodgkinson sprayed a baseball field with at least 70 round of bullets, according to the report, as a Republican baseball team practiced for a game. Rep. Steve Scalise and four other people were injured. Friday's report details every moment of the shooting, including the actions of federal agents and local law enforcement as they were confronted by the gunman. A local Alexandria officer was the first to shoot and wound Hodgkinson, who continue to fire on police after he was wounded. Bullets from a federal agent and another Alexandria police officer eventually brought the gunman down. Porter's report also details Hodgkinson's life in the months leading up to the shooting. Hodgkinson began experiencing financial problems in 2016, according to the report. In March 2017, Hodgkinson told his family he was going to Washington, D.C., to "protest" and "talk about taxes." He drove his van to Washington, D.C., but ended up in Alexandria. Once he arrived in Alexandria, Hodgkinson frequented the YMCA location right next to the baseball diamond in the Del Ray neighborhood, and even went there the morning of the shooting. He also rented a storage facility in the city, where he kept firearms and ammunition. On the day of the shooting, prosecutors believe Hodgkinson retrieved some firearms from his storage unit and returned to the YMCA parking lot. At some point before 7 a.m., he watched the baseball practice as he loaded his firearms. Minutes later, Hodgkinson shot in the vicinity of the field where congressional members and staffers were standing. Speaker of the House Paul Ryan (R-Wisconsin) gave an emotional address to colleagues at the House of Representatives after House Majority Whip Steve Scalise (R-Louisiana) was shot and injured, along with three others, at a congressional baseball practice session Wednesday morning in Alexandria, Virginia. Police previously said that five people were shot. "Rep. Scalise was struck in the hip by a bullet and went down near second base. Mr. Mika was shot in the chest and went down. Capitol Police officers who were assigned to Scalise returned fire, and were soon joined by Alexandria police," the report says. Capitol Police officers who were assigned to Scalise returned fire, and were soon joined by Alexandria police. "The agents and officers reasonably used deadly force until the threat was neutralized, and then, to their credit, they immediately approached the suspect and rendered first-aid," the report explained. Hodgkinson later died from his injuries. Scalise, the House majority whip, was gravely wounded in the shooting. After months of hospitalization and rehabilitation, he returned to the U.S. house last week. Porter says the use of deadly force by the officers was "justified by the doctrine of self-defense" and no charges will be filed against the agents or officers. "The agents and officers should be commended for their bravery and service," Porter said.